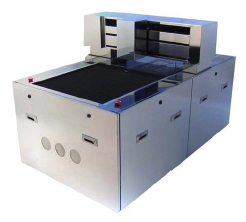 Extends the product lineup measuring and AOI system “ST series” which is the first in the industry，such as from desktop type to large size-enabled system (for example, 810×810�o). All components and softwares are developed and manufactured by ourselves. What!s NEW　High-end machine “ST-3040F/ST-2010F”with granite stage appears on the scene as new product of ST series (measuring and AOI system). �@Granite stage is adopted in this machine; as a result, measuring precision is enhanced dramatically because of improvement of anti-versatility property. �AAlso, cross-roller bearing is adopted for the first time in ST series. 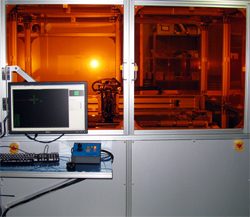 �BResolution capability of motion-controller is 10 nm (ST-3040F) and 5 nm (ST-2010F), and that of mechanical machine is 50 nm (ST-3040F) and 20 nm (ST-2010F). 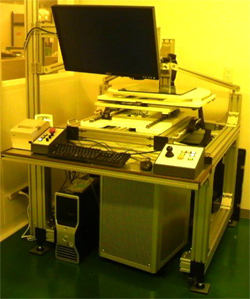 �CAOI function and etching simulator function can be built in by image treatment and data-matching with GPU technology (optional). 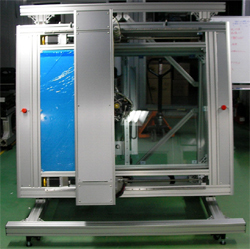 �DThis machine is best suited for high precision photo-mask. The above graph shows covered territory of ST series. 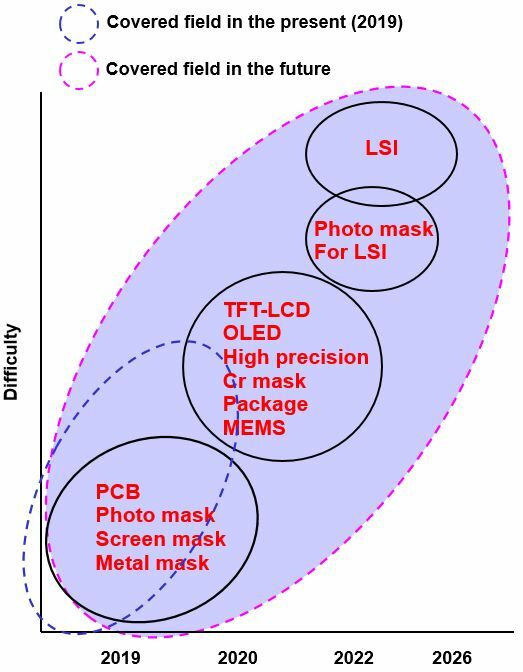 Now, field of ST series is limited to PCB, photo mask, screen mask, metal mask, and so on, however, it will be spread to package substrate, high precision photo mask, LSI, photo mask for LSI use in the future. A reason why territory of product is spread speedy and drastically is based on two following features. One is image processing technology by original software. Another is control technology of hardware with high accuracy, for example, motion controller, moving stage by piezo driving method, laser interferometer, light intensity control of illumination, control of temperature and humidity, and so on. 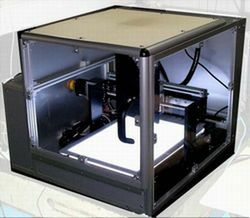 Furthermore, these components and technology are developed by ourselves. 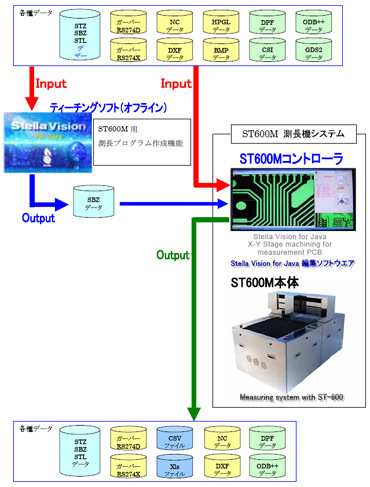 ST series can inspect and measure while linking with CAM system “Stella Vision for Java”. 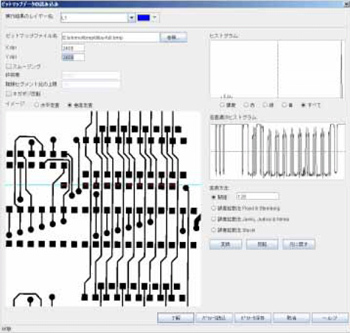 As a result, it can becomes to analyze by use of CAD data (Gerber data, DXF data, and etc.). ST series has measurement function, too. It's possible to measure not only XY dimension but also Z dimension (height, thickness, and so on). Also, it's possible to measure center point and corner part based on angle, circle, figure recognition, too. This system makes it possible to compare absolute value of CAD data in measurement process. Also, you can judge admission decision if you set up acceptable level (± value) before the fact, too. It's possible to feed back calibration value into CAD data easily because it performs measurement while linking with CAM system “Stella Vision for Java”. You can use ST series as NC data making system. Point information gained from this result is fed back into CAM system “Stella Vision for Java” and is output into CAD data. It's possible to capture film image and transform from its data into quasi CAD data. 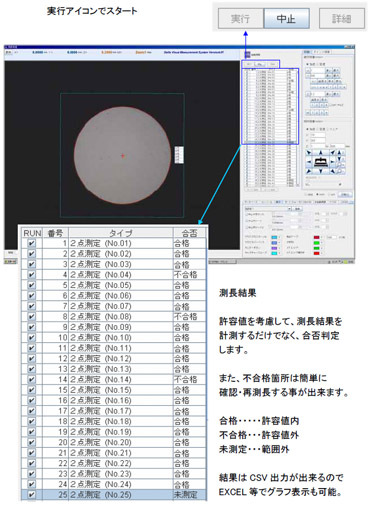 Therefore, it is most suitable for drawing up of Gerber data for flying probe inspection system use. 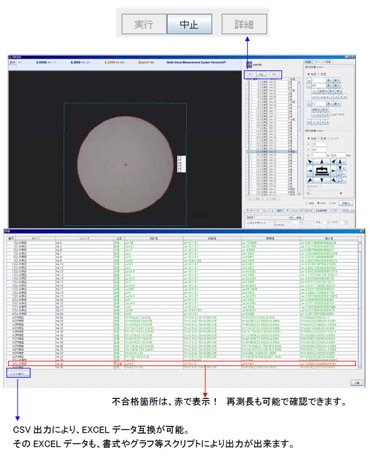 It's most suitable for ISO support and daily checking because it judges admission decision by automatic measurement program. It's most suitable for control process statistically. It's possible to monitor process, discover a problem, judge process quality by data collection and analysis. in a constant temperature chamber. As you know, it is necessary for precise control of temperature in system to measure with high accuracy. In short, pattern dimension displayed on PC monitor is practical value if it is measured in severe controlled environment. ST series equips a constant temperature chamber (optional) which suppresses temperature change to less than ± 0.2 ℃. 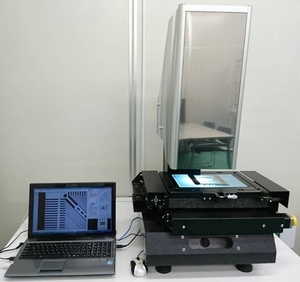 It could succeed to enhance absolute measurement accuracy. Since 1989 our company has established, we have accepted high estimate from users in PCB and photo mask industries because of innovation spirit, low cost ability, original viewpoint, practical result. We invested R&D substantially based on our slogan “Something Special”, in short, our target is different from that of other persons. 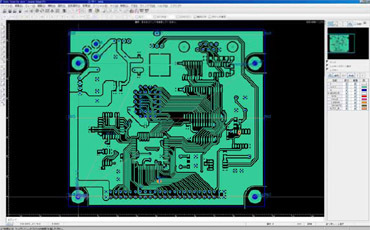 Our original technology is spread to machine design, electronics circuit design, optics design, development of IC, development of computer software. We have developed these technology by ourselves. Therefore, we can propose a novel product based on various viewpoint for our users by mass technology in the office. ST series which is one of our products equips not only measurement function with various and multiple methods in easy operation but also drawing up function which draws up vector data from image capture and measurement result. 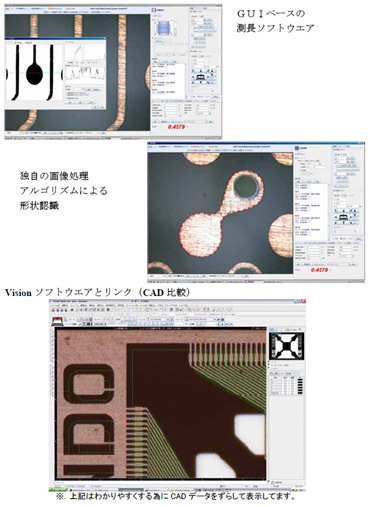 It operates by our CAD/CAM software “Stella Vision for JAVA”, so that, makes it possible to specify measurement area on CAD data and write output measurement result into CAD data easily. You can transform this output data into various support formats such as Gerber, DXF, and so on. Additionally, you can capture edge part of object which is difficult to capture because of low contrast by various image processing functions. It's supports basic measurement objects such as line width, distance between 2 or 3 points, distance between multiple line, diameter, circle, angle, and so on. It's possible to measure various points by combination use of positioning function. It has various coordinate positioning function which assists movement of measurement point. It equips image focus function. It's possible to focus various objects because of indicating sampling range and position of focus by easy mouse operation. 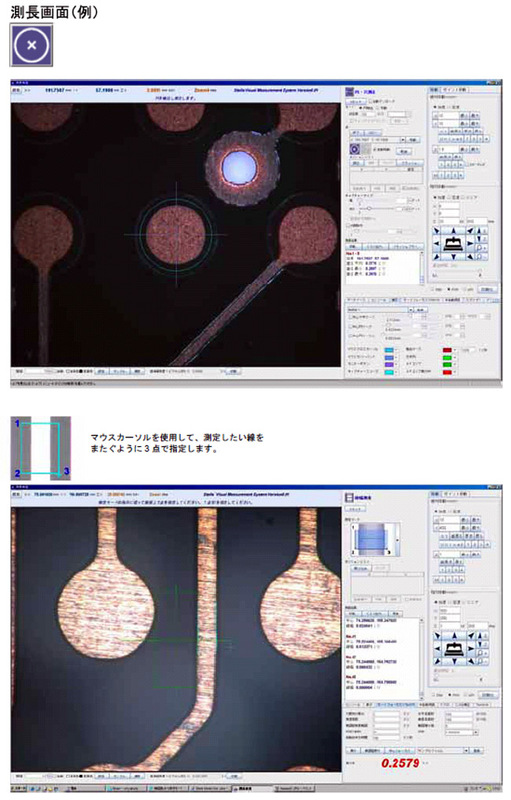 As a result, it's possible to measure Z dimension, for example, thickness of solder, copper foil, and so on. Measurement result is written output into CAD data, text file based on the CSV format, and a companion printer. 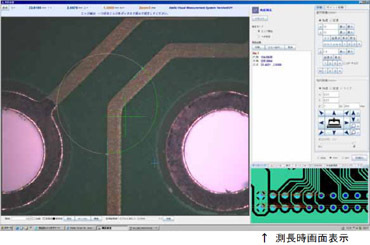 In this function, you set up measurement point such as line width, diameter of hole, distance, angle based on CAD data and make up measurement data. Then, you measure based on the measurement data. Also, you can compare the measurement result and an original design data. It's possible to make up measurement program by teaching measurement method. It's possible to transform composite image into polyline data by use of patchwork function which shoots a monitoring substrate and makes a composite picture. Also, it equips figure drawing function which draws up CAD data by input of point while seeing camera image. Concretely, it's possible to draw up polyline and flash. 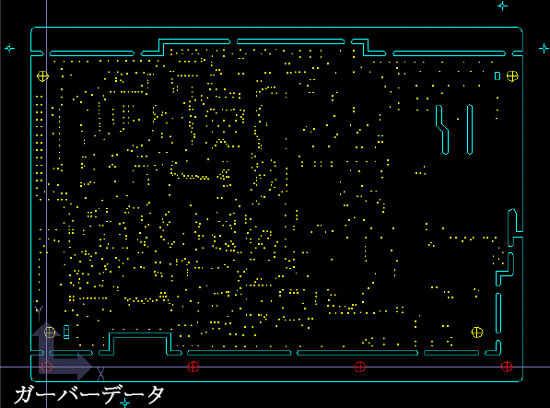 By these function, it's possible to draw up data of a film without data. This system makes it possible to capture by automatic NC data making function by combination use of CAD data drawing up function while it captures NC hole open information in a substrate. It's possible to set up a measurement program in respect to CAD data. You choose measurement item and configure it as CAD data. In this time, you can judge admission decision in automatic measurement process by input of acceptable value. The above graph shows functions of ST series. 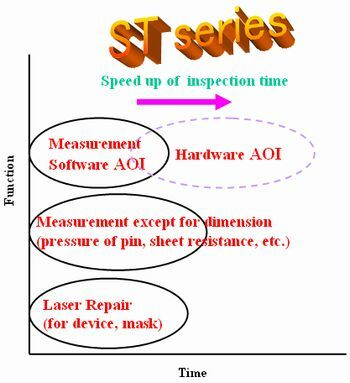 In the past, main functions are three such as measurement, software AOI, and laser repair. 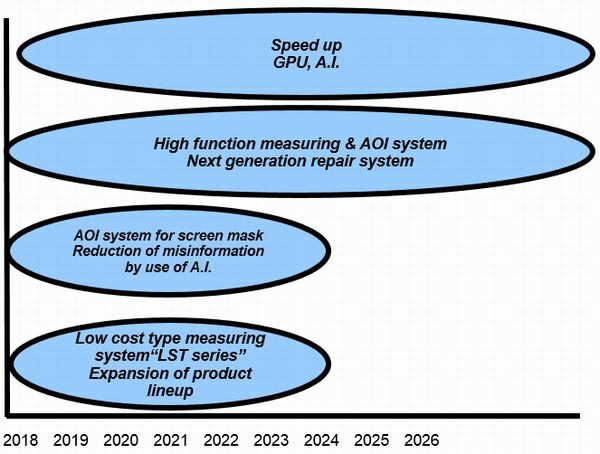 However, we have brushed up a hardware AOI system with image processing board recently. As a result, we have succeeded to reduce inspection time drastically.